We present our Persons Holding Colorful Puzzles Globe PowerPoint Templates PPT Background for Slides 1112.Use our Puzzles or jigsaws PowerPoint Templates because; your ideas are fundamentally stable with a broad base of workable possibilities. Use our Teamwork PowerPoint Templates because, various threads are joining up and being stitched together providing necessary strength Now you have to take the last leap. Use our People PowerPoint Templates because; adorn them with your ideas and thoughts. Use our Business PowerPoint Templates because, it is in your DNA to analyses possible causes to the minutest detail. Use our Globe PowerPoint Templates because, Business ethics is an essential element in your growth. 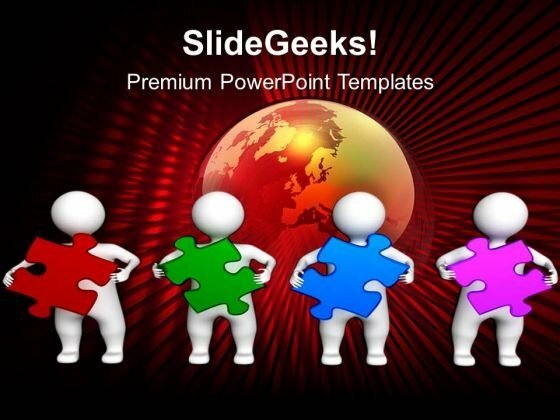 Use these PowerPoint slides for presentations relating to "Four people holding puzzle pieces, teamwork, business, people, puzzles or jigsaws, globe". The prominent colors used in the PowerPoint template are Red, Green, and Blue Get your team to fall in line. Command their attention with our Persons Holding Colorful Puzzles Globe PowerPoint Templates Ppt Background For Slides 1112. Avoid fiascos with our Persons Holding Colorful Puzzles Globe PowerPoint Templates Ppt Background For Slides 1112. You will be armed to face any contingency.